After a congenial first Congressional hearing, I had high expectations for the Full Committee Markup on the Interior and Environment Bill. I walked to Rayburn Wednesday morning with a bright smile and optimistic attitude toward the bill and our legislators. Unlike the previous markup I attended, the full committee didn’t spend any time on pleasantries and instead started introducing amendments right away. I noticed after the first two votes that the room was separated – Republicans all sat together on one side of the room while Democrats sat together on the other. I couldn’t help but compare it to the cafeteria at my high school. I wondered why there was such a difference in the atmosphere of the subcommittee and the full committee. Subcommittees meet more regularly and with fewer members than full committees, which fosters closer relationships among those members. They are allowed more time to voice their personal opinions and listen to others. At first, I was very frustrated at the way the full committee worked. However, now that I’ve gained some distance, I see that full committees have a very limited amount of time to work through a vast amount of legislation. Arguments must be brief and voting must take place quickly, otherwise we could still be working through bills passed two years ago. It is important to realize the limitations our leaders are under, especially in these last few weeks of summer. Making decisions for myself is hard enough – I can’t imagine deciding on appropriations and laws for the federal government! I learned Wednesday that I need to have more realistic expectations for our leaders, as they are doing the best they can with the resources they have. Can You Name the Supreme Court Justices? Maybe you can. Maybe you can't (I'm not sure I can), but either way these nine people are about to dramatically impact the future of health care in this country. That's because the decision regarding the constitutionality of the recently passed health care bill will be handed down on Thursday, and no one, not even the President or House and Senate leaders, have any idea what will happen. I don't either, so don't ask. In fact, I'm not a lawyer so I can't even make an educated guess. The question at issue is whether a mandate to purchase health insurance is constitutional. As the oft-forgotten third branch of government, the Supreme Court gets to decide these things. Their role is to interpret, as best and as independently as they can, whether a specific contested provision of law is in keeping with Constitutional principles. The most important word in that last sentence is "independently." The founding fathers went to great lengths to protect the judiciary from undue influence from other branches of government. At the same time, the founding fathers worked to balance independence with the need to connect the Judiciary to our democratic process. This means there's clearly a political component to the decision as well, which boils down to this: those leading the health care reform effort traded the prohibition on not covering pre-existing conditions with the mandate to purchase insurance. In other words, those concerned about a requirement to provide coverage for some of the least healthy members of the population were given the benefit of having more people buy insurance. If the mandate is struck down, the wildly popular "pre-existing condition" clause goes down as well. Either way, members of Congress and the Administration will need to deal with the aftermath of the decision. If it's deemed unconstitutional there will either be efforts to solve the problem legislatively or it will be used as an enormous campaign issue (or both). If it's deemed constitutional, you better believe there will be additional efforts in the legislature to pass a repeal. Washington, D.C. will be hot this summer, both politically and temperature-wise. Stay tuned. Diary of an Intern: First Congressional Markup! I learned of my internship at Advocacy Associates back in March and did what any college girl my age would do – I made a Pinterest board of work outfits, apartment decorations, and pretty pictures of the Capitol. I allowed myself to be swept up in romantic notions of spending the summer in the city. So when I stepped off my train at Union Station, suitcases and Metro card in hand, I had a bit of a culture shock and realized I had my work cut out for me. 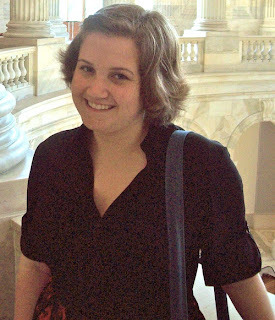 Coming from a small town in Georgia, DC has been a place of many firsts for me, including my first trip to a Congressional markup as part of the Advocacy Associates team. Last Wednesday, Tess and I rode the Metro to the Capitol South station to cover the markup of the FY13 Interior and Environment Bill. As a newbie to the Metro system, I was glad to learn that the station was only a block from the House office buildings. In the 100 degree heat, not walking too far was great! The hallways in the office buildings were confusing – it seemed like the room numbers didn’t make much sense. I could probably work on the Hill for years and still not know my way around. I’m not sure how Congressional interns do it! After we found the room, we waited in a line outside for about an hour and a half. Though we arrived very early, Tess and I were some of the last to make it into the room and had to stand in the back. I will definitely remember that for next time! After years of hearing about the “battles” on Capitol Hill between Republicans and Democrats, I was expecting nothing short of a smack-down in the subcommittee room. I’m sure the look on my face was nothing short of confused when all members were genuinely friendly towards each other. During the meeting, everyone turned their comments to Rep. Dicks, who is retiring after 36 years in Congress. Each member expressed their appreciation and respect for him and the work he has done throughout his career. When it came time for Rep. Dicks to speak, he actually became very emotional and had a hard time getting through his prepared statements. When specifics about the bill came up, each member expressed his or her opinions politely but defended their positions emphatically. The meeting was relatively brief but I find myself still analyzing certain aspects. I appreciated being able to see the more human side of our government. I’d always imagined Congress to be more of a machine than a group of individuals. Witnessing negotiations and debate changed the way I view our leaders, and I have even more respect for them now. Tomorrow I am headed back to the Hill to cover the full committee markup. Now that I know a bit more about what to expect, I am confident that I will be able to dig deeper into specifics of the bill and the political ramifications of the decisions made by the committee. In time, I hope to be just as savvy on the Hill as my colleagues (and able to find my way around, too!). Today, the Senate passed the S.3240, Agriculture Reform and Food and Jobs Act of 2012, or the Farm Bill, by a vote of 64-35. The House is poised to take up its version of the bill on July 11. Next week it is expected that the debate on the agriculture appropriations bill will be a barometer for future debate on the Farm Bill. Below you will find the results on the final amendments that were voted on today. Passed by a voice vote. Votes on amendments to the Senate Farm Bill continued today. Unfortunately, the Senate did not get through all the amendments and will finish tomorrow. In the meantime, you will find an update list below of amendment voting results. Did not pass on a voice vote. Passed on a division vote. Did not pass by a voice vote. .
Today, the Senate began voting on the 73 amendments offered to S.3240, Agriculture Reform, Food, and Jobs Act of 2012, commonly referred to as the Farm Bill. Below you will see the results of today's votes.